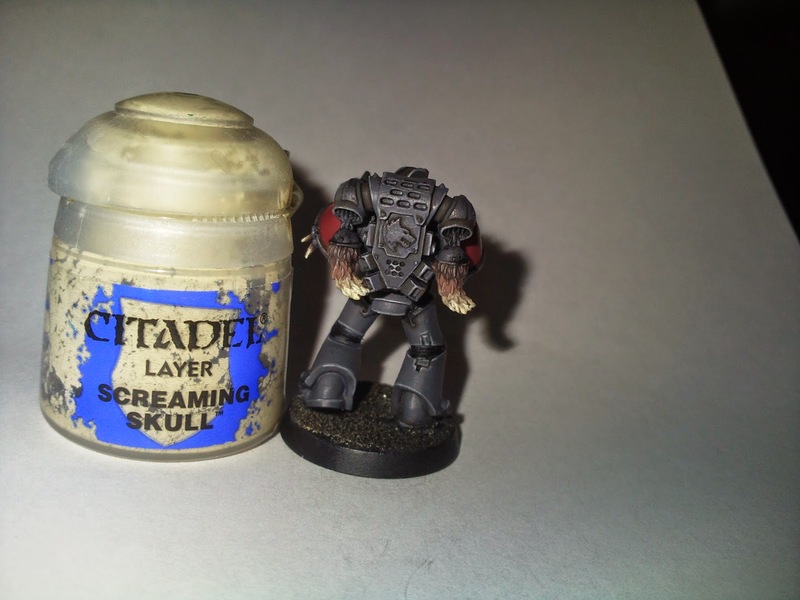 Welcome to my tutorial for how I paint my Space Wolves. 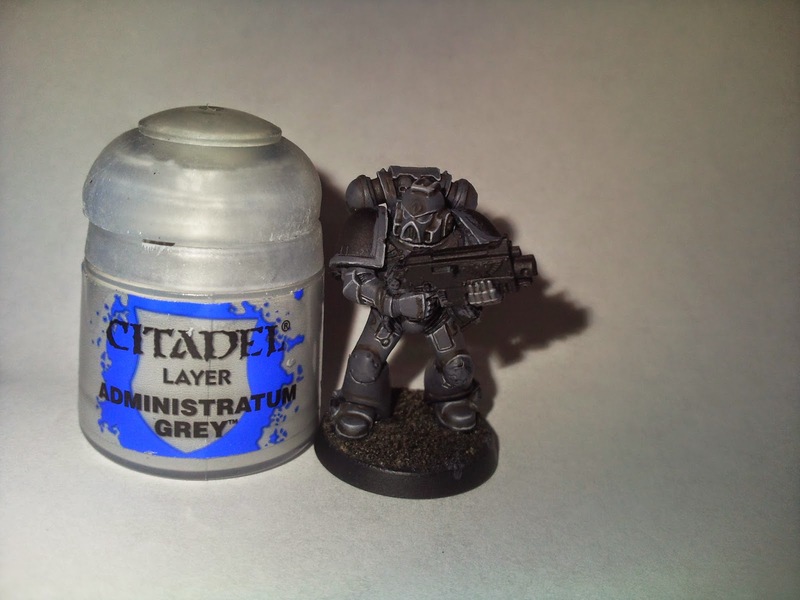 I personally dislike the 'traditional' baby blue that GW paint their studio Space Wolf army and so decided to paint mine with dark, storm grey armour, much like their Pre-Heresy colour scheme. 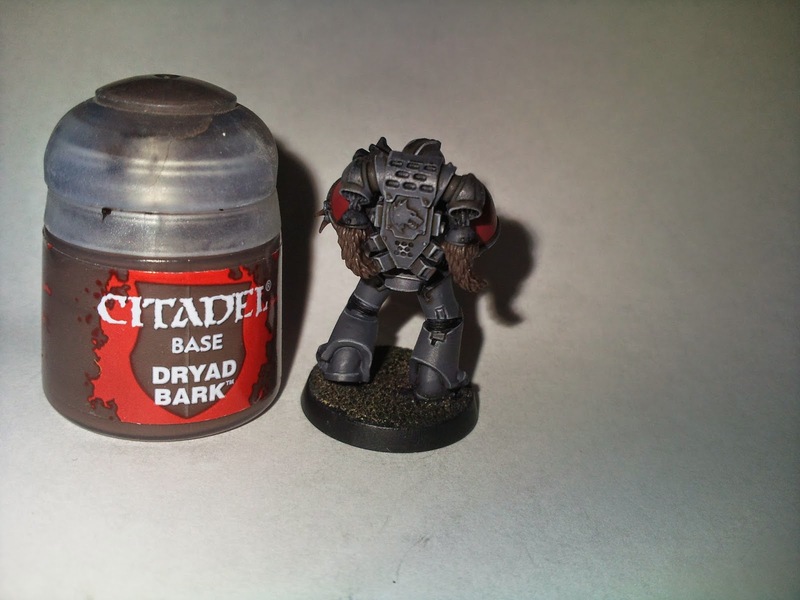 I also opted to represent Harald Deathwolf's Company as opposed to Ragnar's so mine will sport red shoulders and detailing instead of yellow. 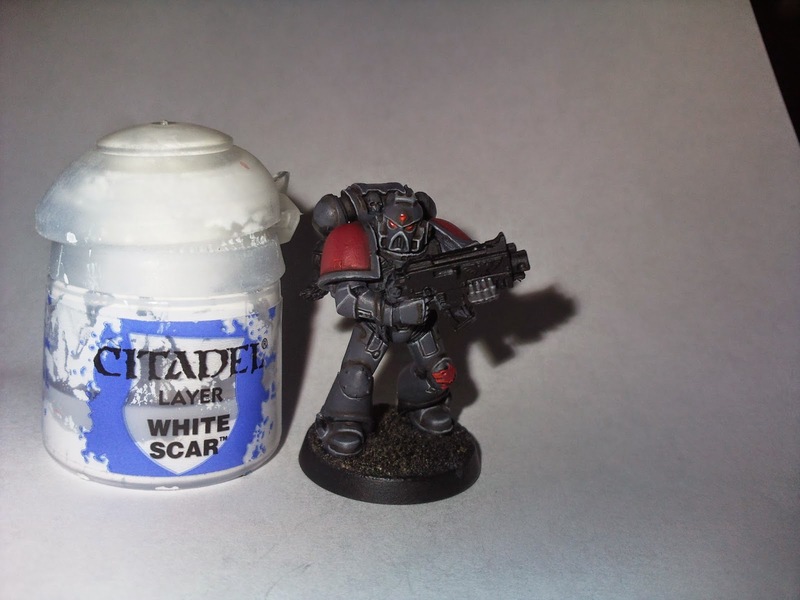 First step is to base and prime the models but as this is widely done by most hobbyists anyway I decided to leave it out of the tutorial and start from the first base coat. 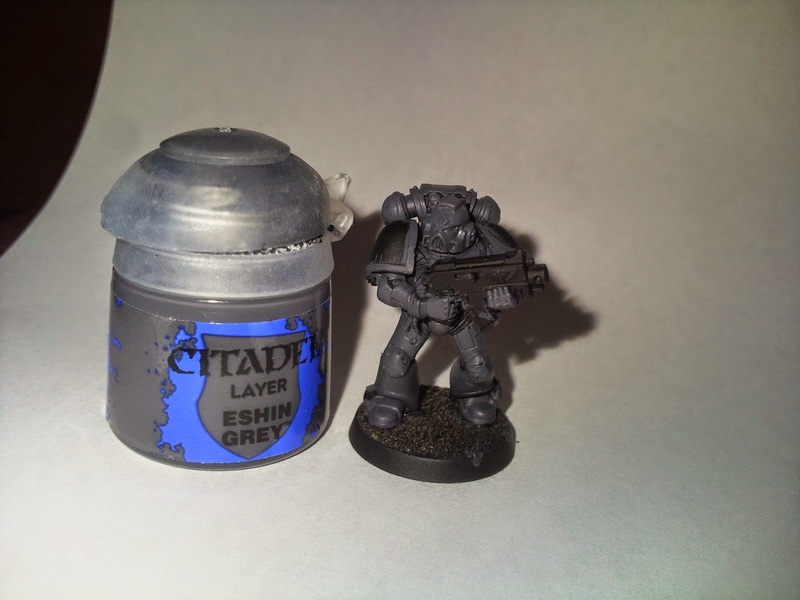 The first step is to base coat the Power Armour with Eshin Grey. A good solid base coat is needed so it may take 2 coats. I'm generally quite messy at this stage to save time as any grey on other parts of the model will be covered anyway. 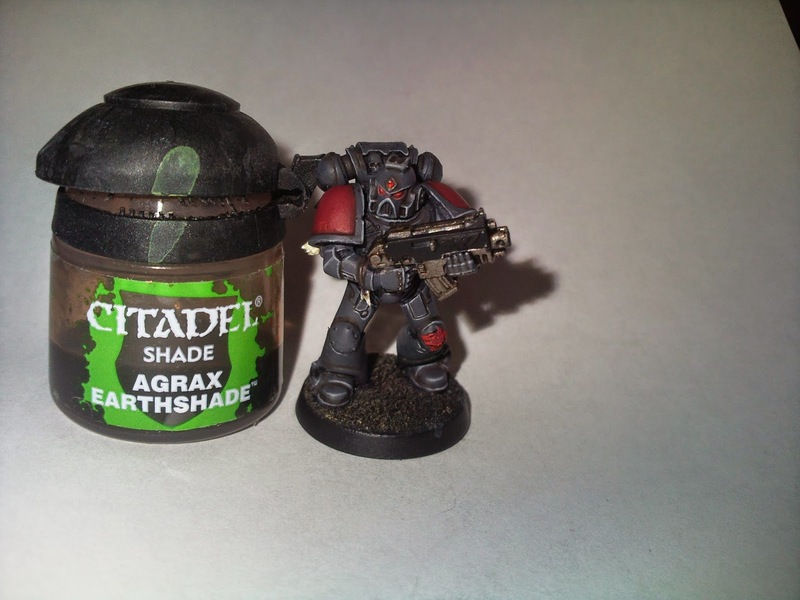 The next step is to shade the grey with Agrax Earthshade. Rather than washing the model I apply the paint directly into the recesses to avoid unnecessary pooling on the armour. 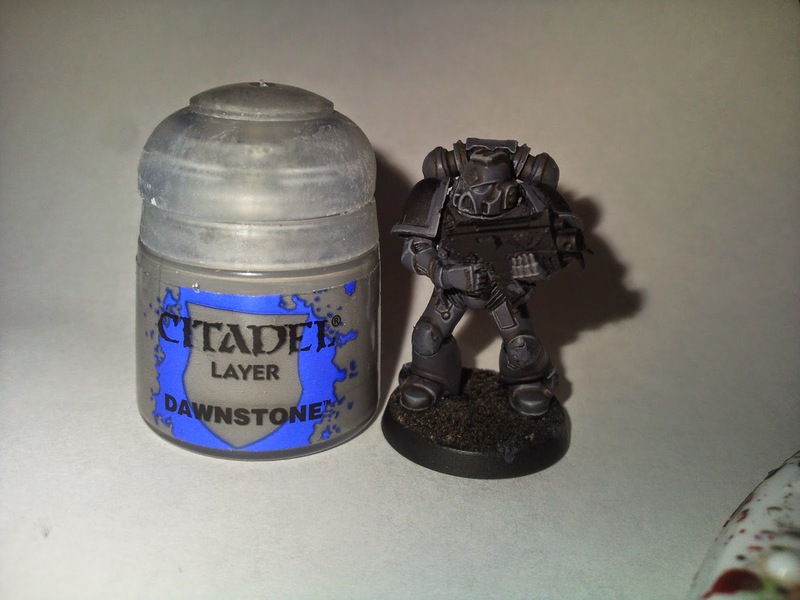 Once the shading is fully dry I move onto highlighting the armour with Dawnstone. 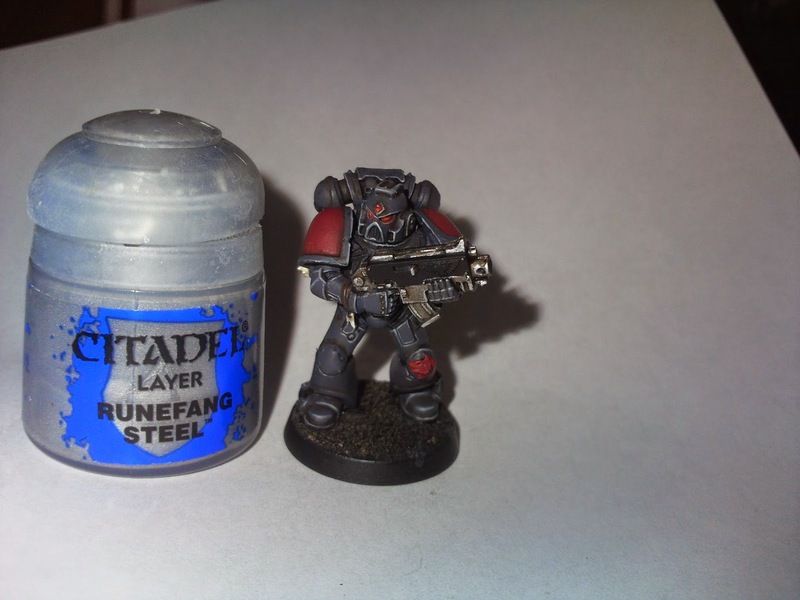 Watering down the paint here is essential to get nice clean straight lines, focusing on the edges of the armour plates. Take your time here but don't worry too much about mistakes as it's simple enough to correct with some Eshin grey. 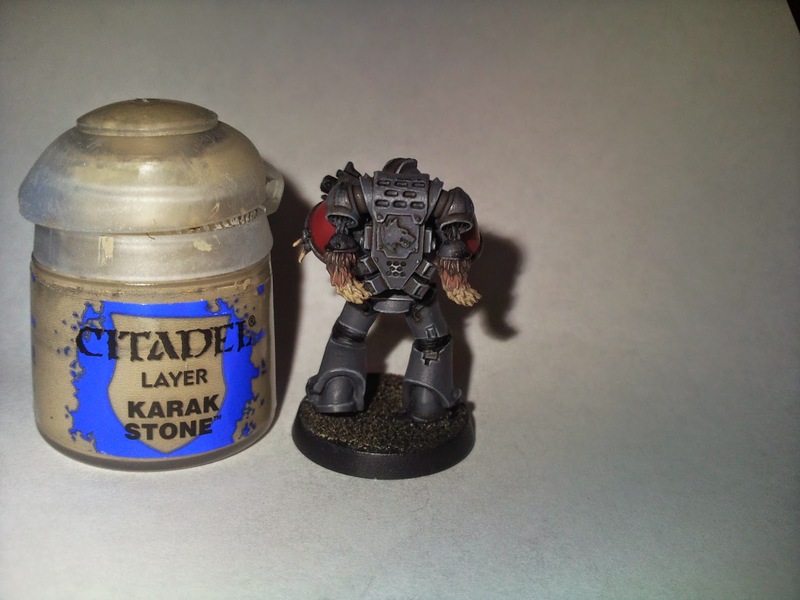 The final step for the armour is a fine highlight of Administratum grey which is applied to the very edges of the armour such as on the ridges above and below the eye lenses, the elbows, finger tips, and shoulder pads etc. 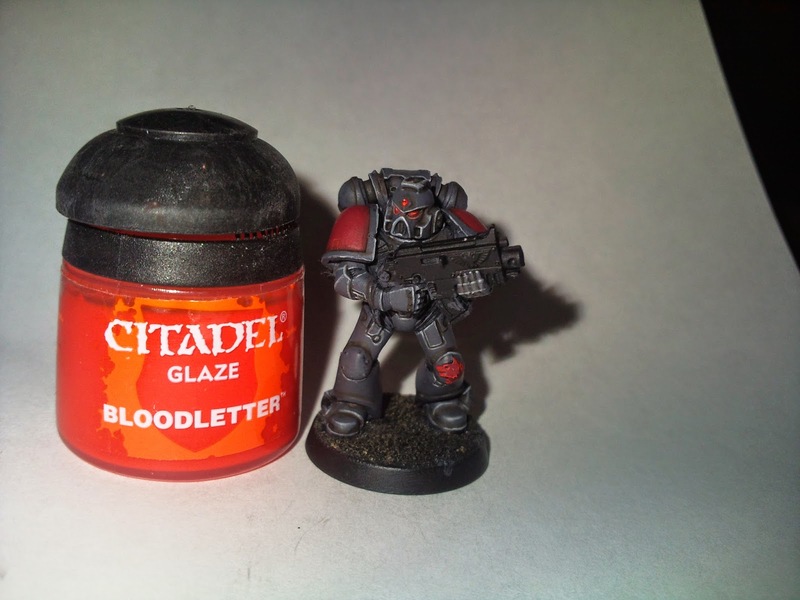 All the red areas such as the shoulder pads, eye lenses and purity seals are given a coat of Khorne red. This may take two coats so make sure to water the red down. 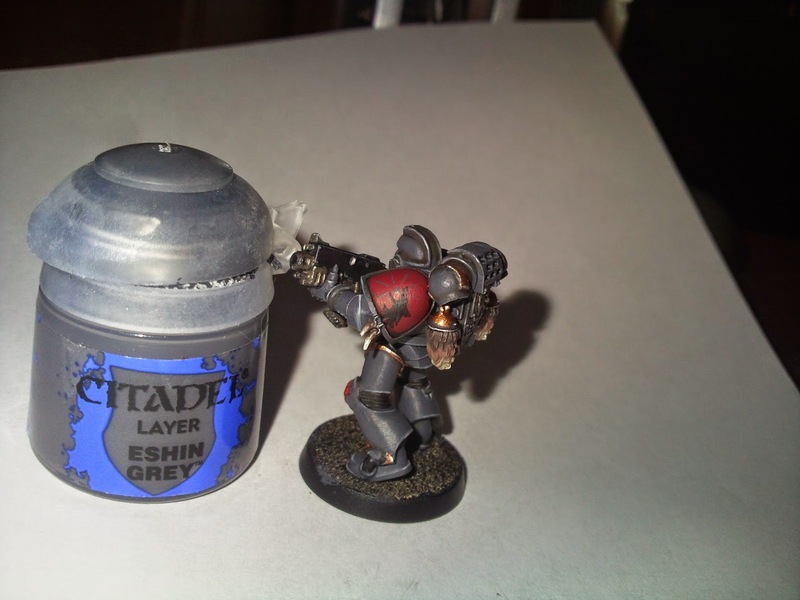 These areas are then given a shading with Agrax eathshade, applied in a similar manner to the shade on the armour. 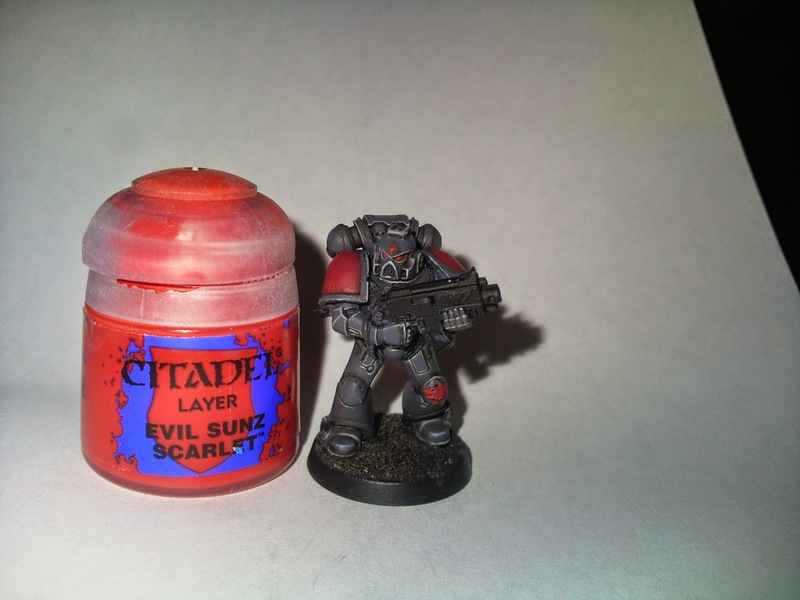 The eyes, purity seal and other red details are highlighted with Evil Sunz Scarlet. Make sure to leave some of the previous red visible on the eyes. 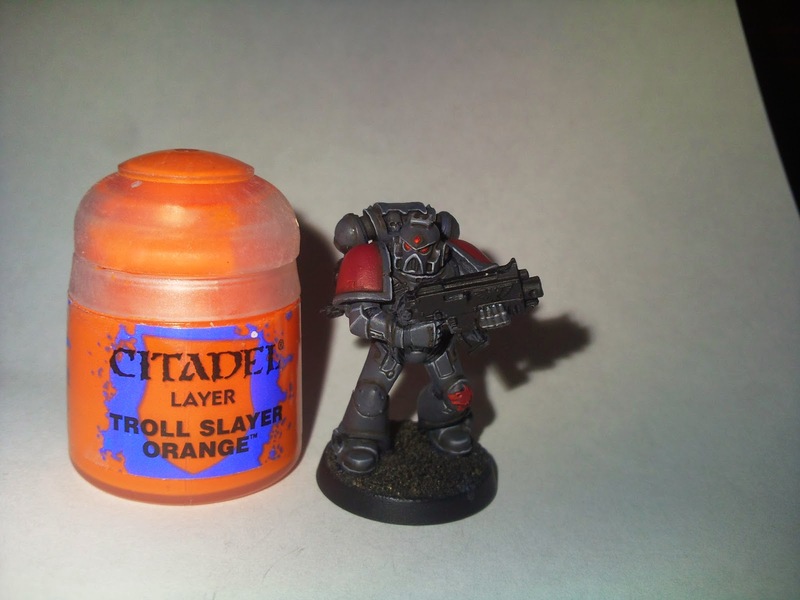 The eyes are given a fine highlight of Troll Slayer Orange, painting a fine line inside the previous red. 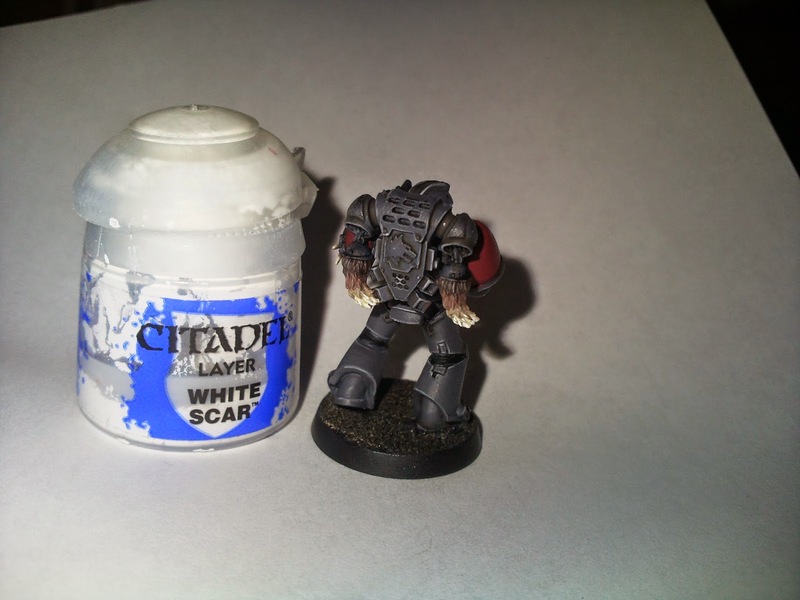 Using a fine detail brush, paint a tiny line of White scar in the centre of the previously applied orange. Watering the paint down and being patient is the key here. Take your time and make sure your wrists are braced together to insure your hands are as steady as possible. 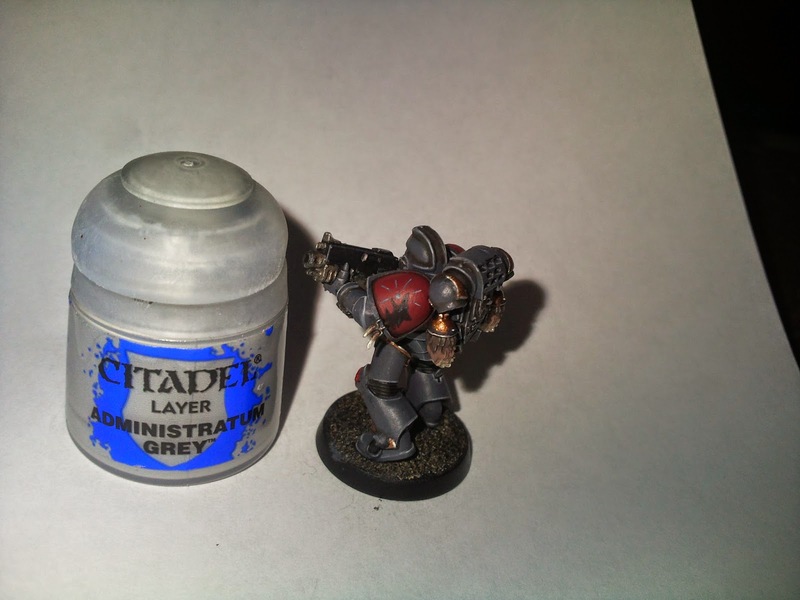 Finally I apply a glaze of Bloodletter to the entire eye lense and also to the grey ridge around the area to create the glow effect. This usually takes to coats to build up the required coat but you can do this to taste by adding as many layers of the glaze as you want. For the fur I apply Gorthor Brown a quarter of the way down the area as you can see on the above image. 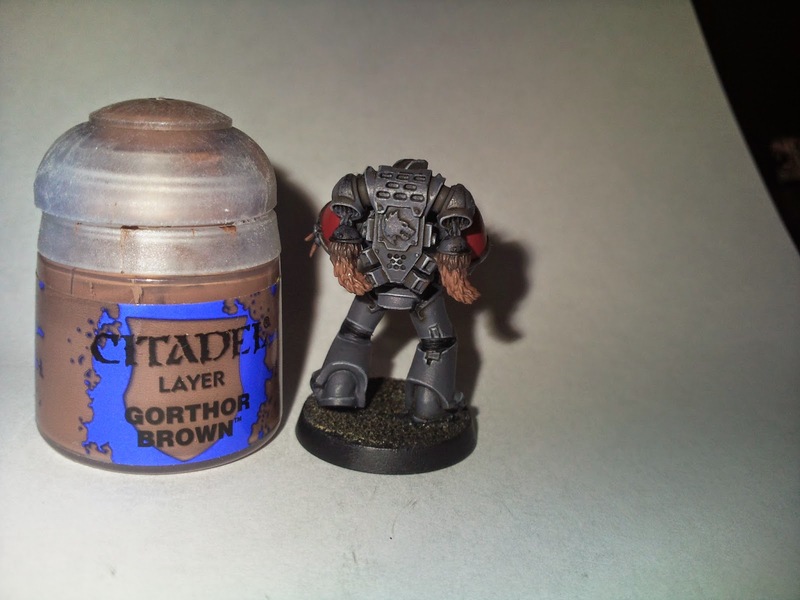 For the teeth and Purity seals I fully coat them with Gorthor brown. The next layer for the fur is Karak Stone and is applied halfway down the fur. The teeth and Seals are layered with Karak Stone leaving some of the previous brown visible. The bottom of the fur is coated with Screaming Skull while the seals and teeth are highlighted with fine lines along their edges. Finally I apply Skull white as a highlight to the bottom of the fur, using it to pick out the ridges and tufts of the fur. 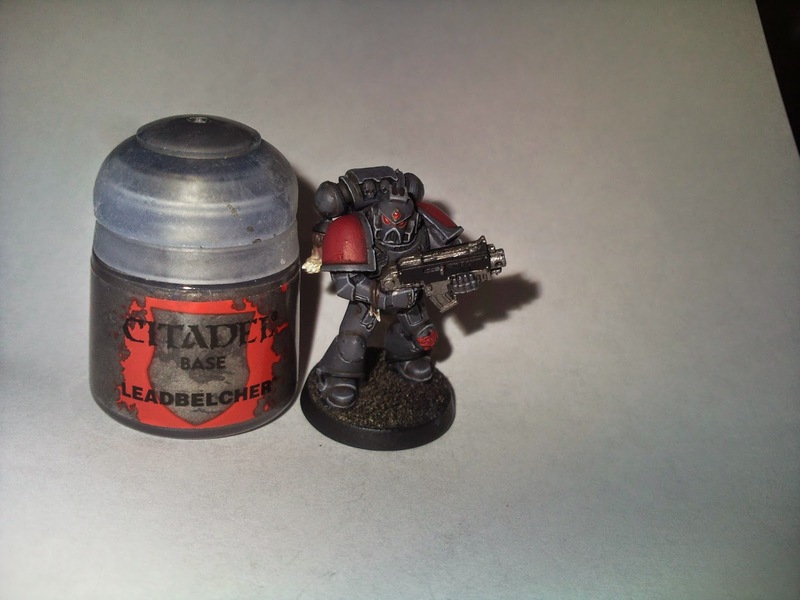 The Boltgun, the chain links holding the teeth, and any trims you want to be metal are base coated with Leadbelcher. 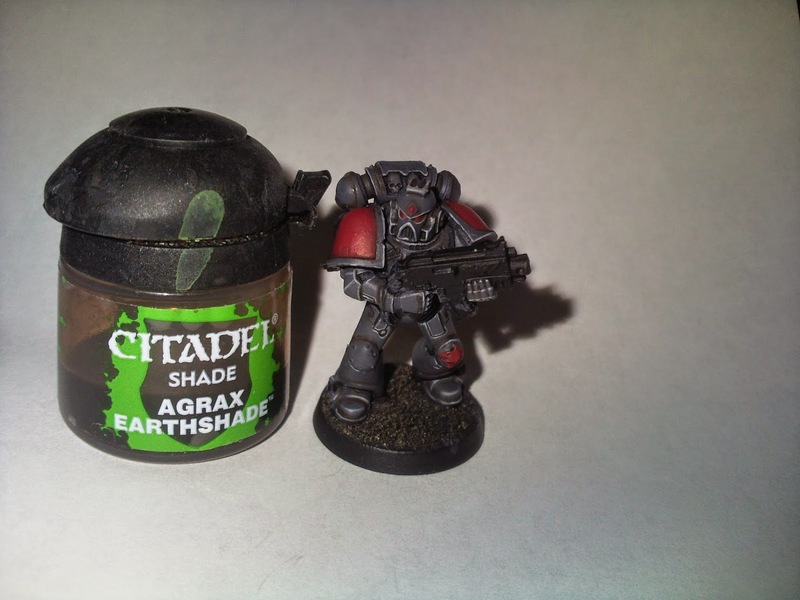 Next I shade the metallic areas with Agrax Earthshade, applying it all over the areas. Once the wash is dry I highlight the metal areas with Runefang steel, picking out the edges of the Boltgun and its details. 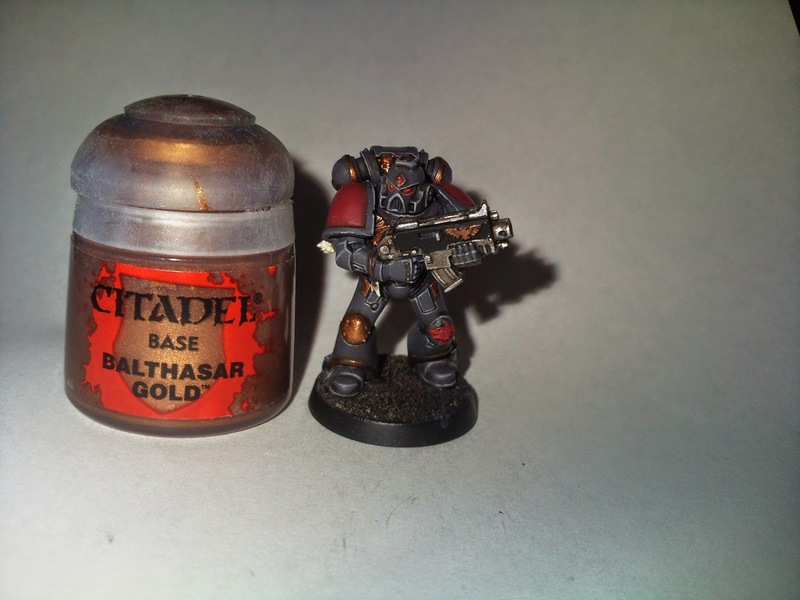 Now for the gold I base coat the areas with Balthazar Gold. Again this may take two coats to cover properly. To add some depth and colour to the gold I use Guilliman glaze, applying it to the details on the gold areas such as the wings of the Aquila on the Boltgun and the rivets on the models right knee pad. 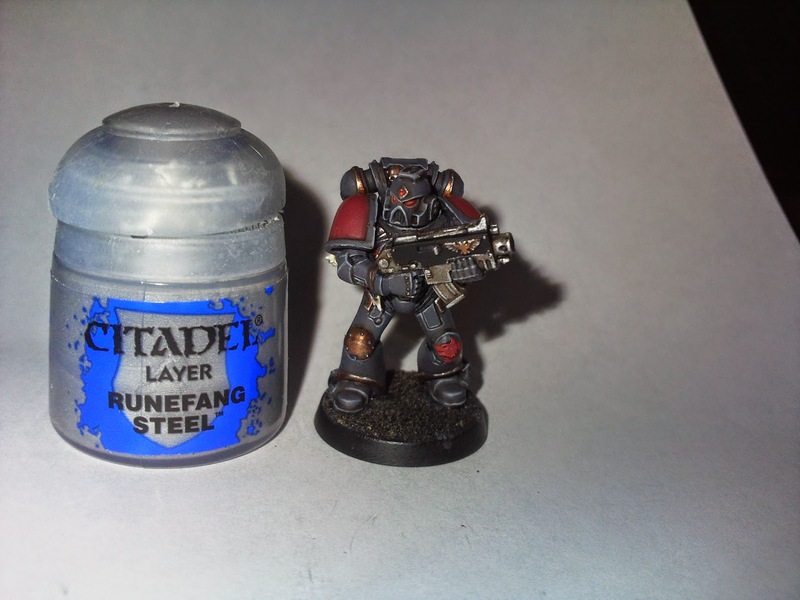 To highlight the gold I use Runefang Steel. This gives the gold a really bright, sharp appearance that helps it stand out from the armour and make it look raised. I apply it to the top most edges such as the wings of the Aquila and the tops of the armour trims. 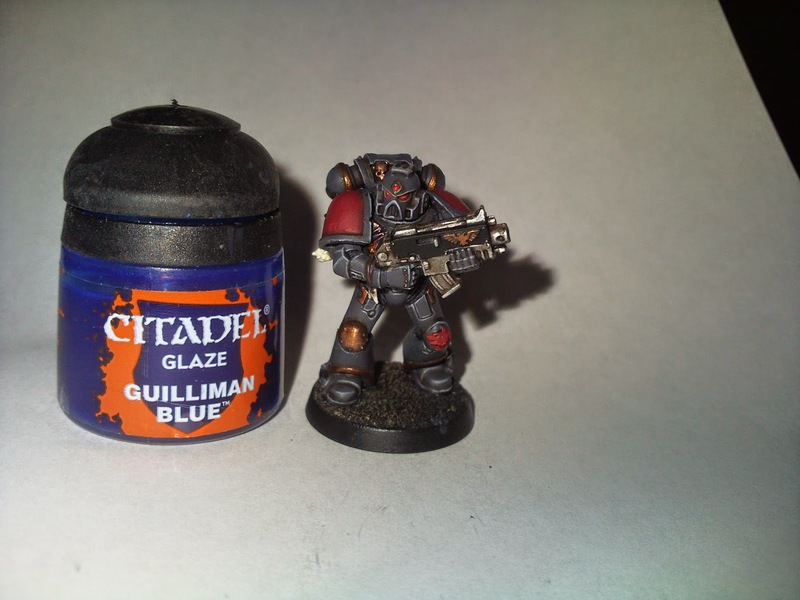 The Boltgun casing is given a thin edge highlight of Eshin grey. 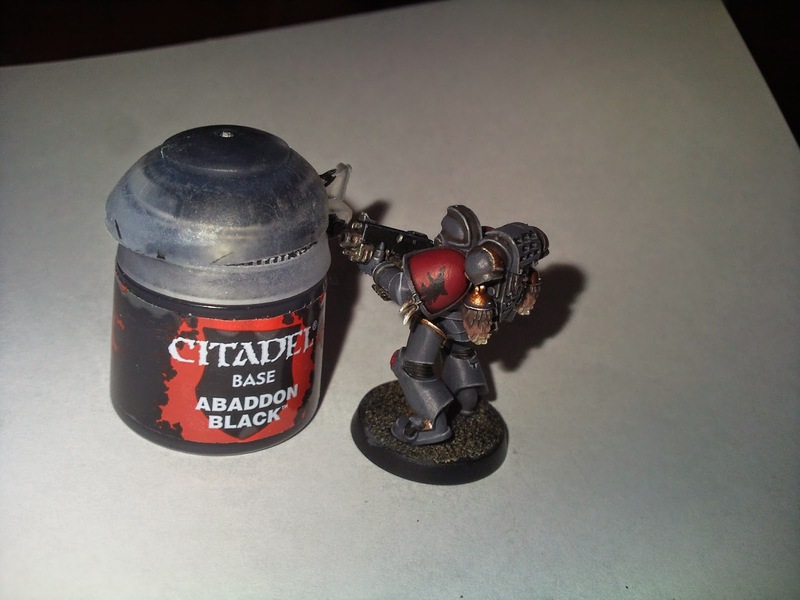 The soft armour at the joints is painted with Abbadon black. 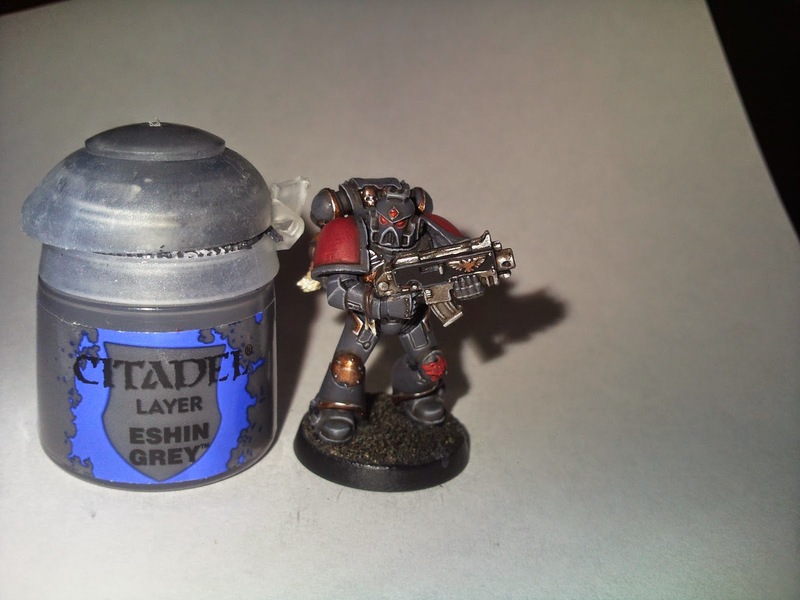 This is also a good time to go back and correct any mistakes on the armour with Eshin grey. Now I move on to the Company and Pack Markings. For this it is really helpful to have some reference material to use as a guide. 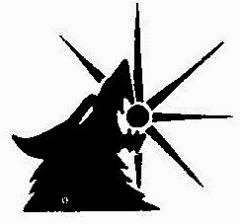 As I'm doing Deathwolf's Company the Company bade is that of a wolf's head swallowing the sun. 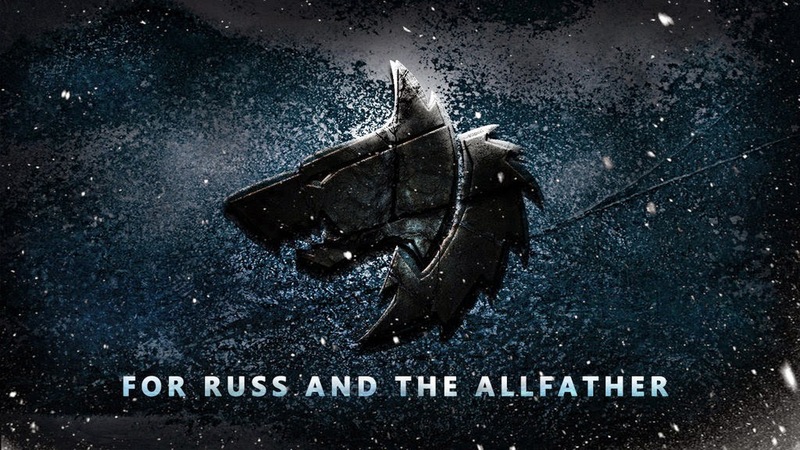 Using thinned down Abbadon Black I slowly sketch out the rough shape of the wolf's head, referring back to the image of the symbol to make sure I'm getting the basic shape correct. 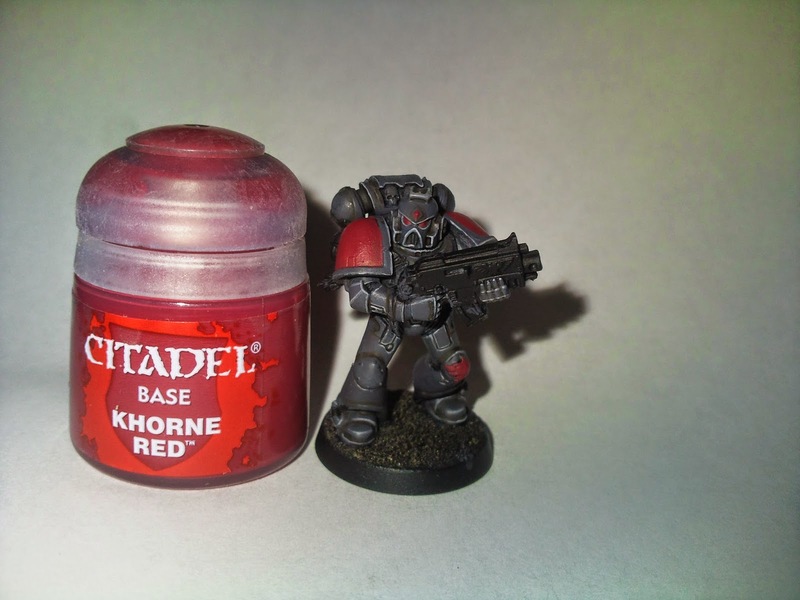 It's important to take your time here and make sure your paint is sufficiently watered down so it flows well and is easily covered with Khorne Red should any mistakes be made. With the Wolf head finished and any mistakes corrected with Khorne red, I move onto the fairly simple sun beams. These are painted with watered down Eshin grey. I rotate/tilt the model accordingly so that I'm painting the lines downwards which gives me more brush control. The wolf head is highlight with Eshin grey, focusing on the top of the head and the curve of the mouth. I also painted the wolf's eye with a fine detail brush. 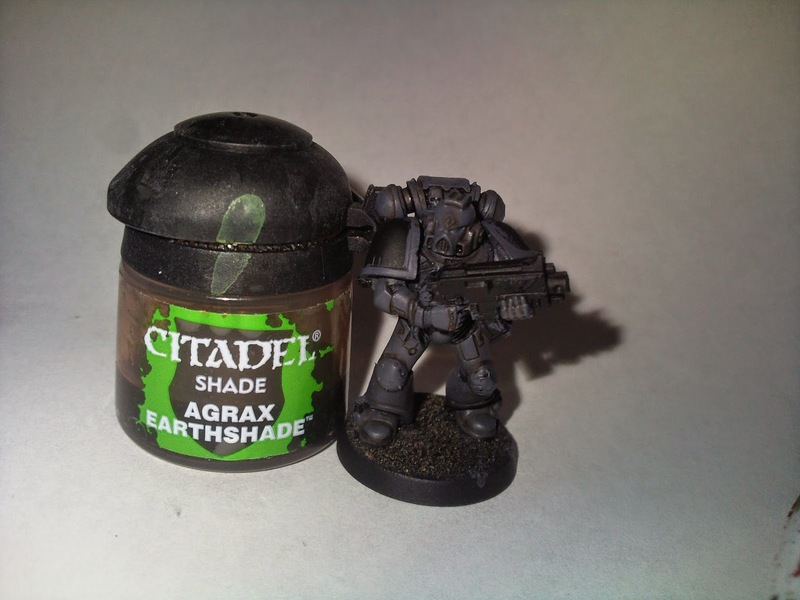 To finish the Company symbol the sun beams are highlighted with Administratum grey, using a fine detail brush to apply the paint within the previous grey. 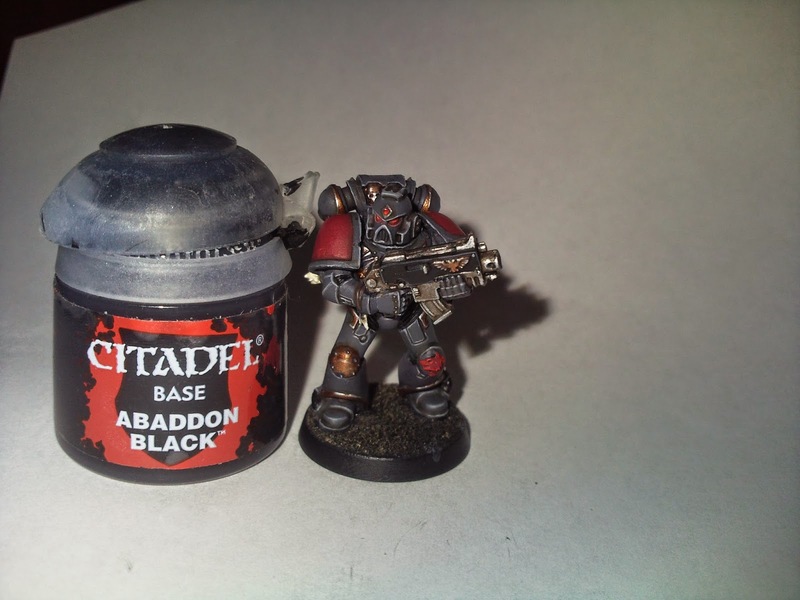 This next step is completely optional depending on how if you want to add some slight battle damage to the models. I find it does add that extra little detail to the model and is worth the short time required to do. 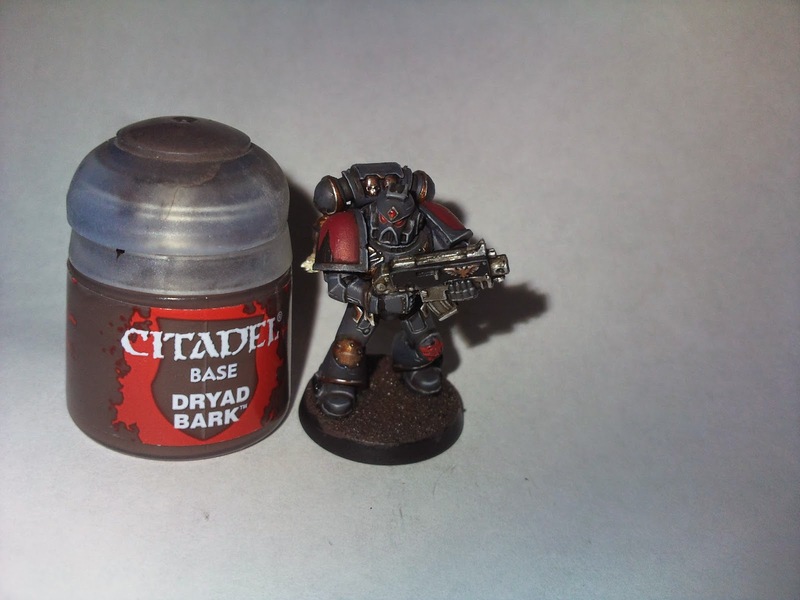 Using a fine detail brush paint a small, thin line of Dryad Bark onto the armour panels. 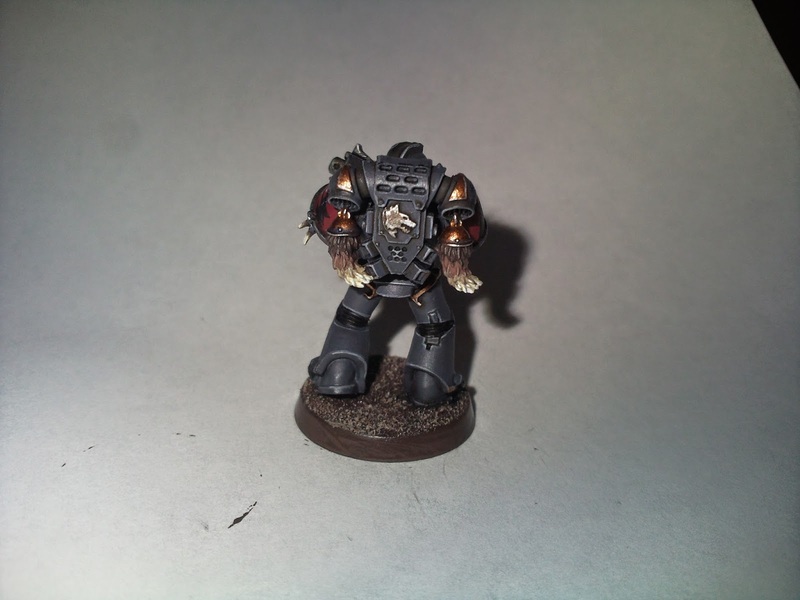 I find areas such as the model's greaves and elbows are a good place to paint these. To finish the chips use watered down Dawnstone to paint another thin line onto the greaves directly under the previous line. This gives the chip/scratch a 3d look. Now the basing is obviously subject to personal preference but as the armour is so dark and grey I've opted for a soil/ woodland look as opposed to my oft preferred urban bases. 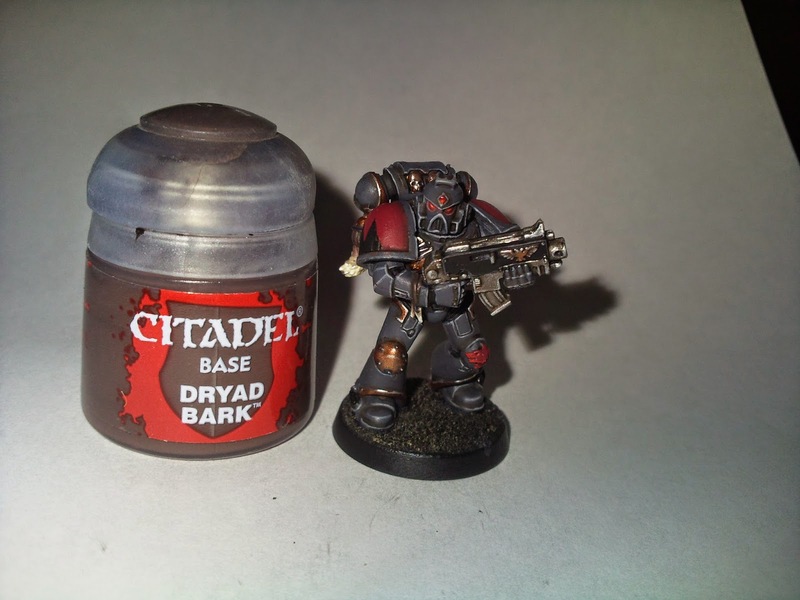 Use Dray Bark to base coat the sand completely. 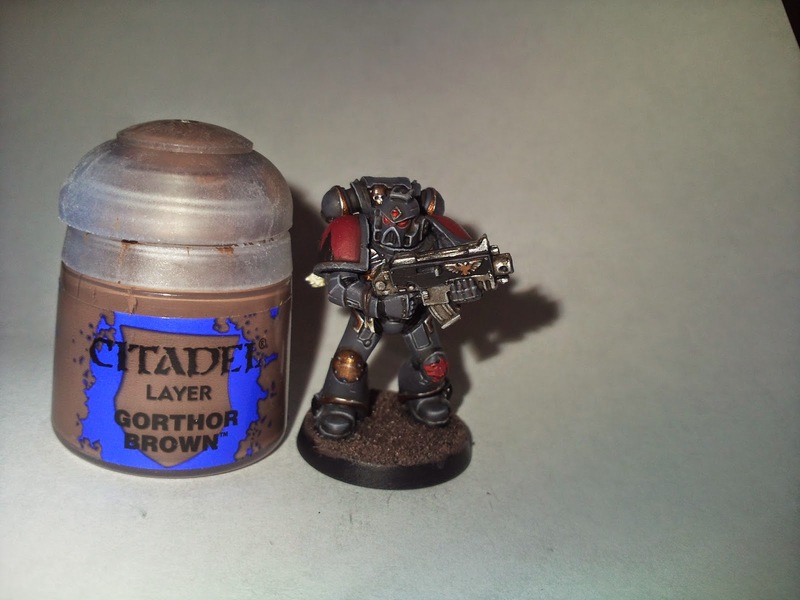 Once the previous coat is dry I use Gorthor Brown to dry brush the sand. 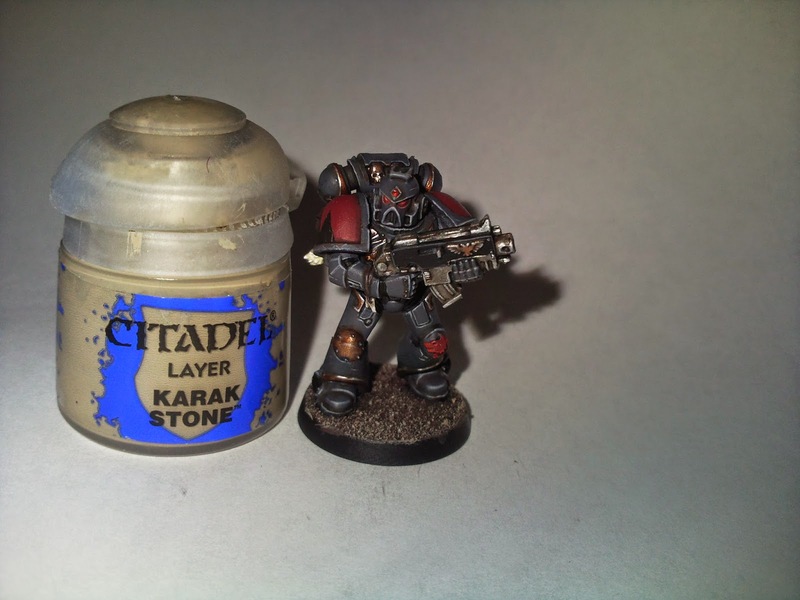 Next up I dry brush the sand with Karak Stone. The very last step is to use and old brush to paint the rim of the base with Dryad Bark. With that the model is complete. I hope this tutorial wasn't too long winded and is insightful/ helpful in some way. 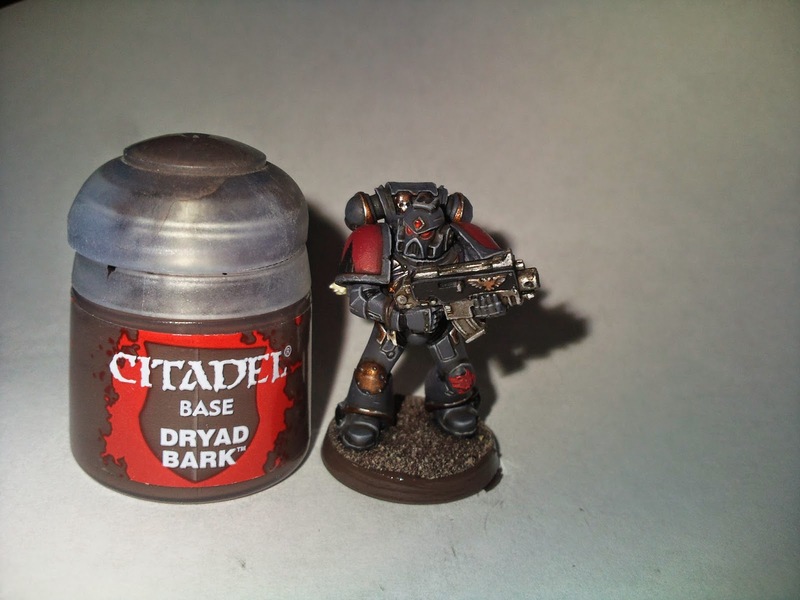 This is a great scheme and similar to how I'm painting my wolves at the mo. 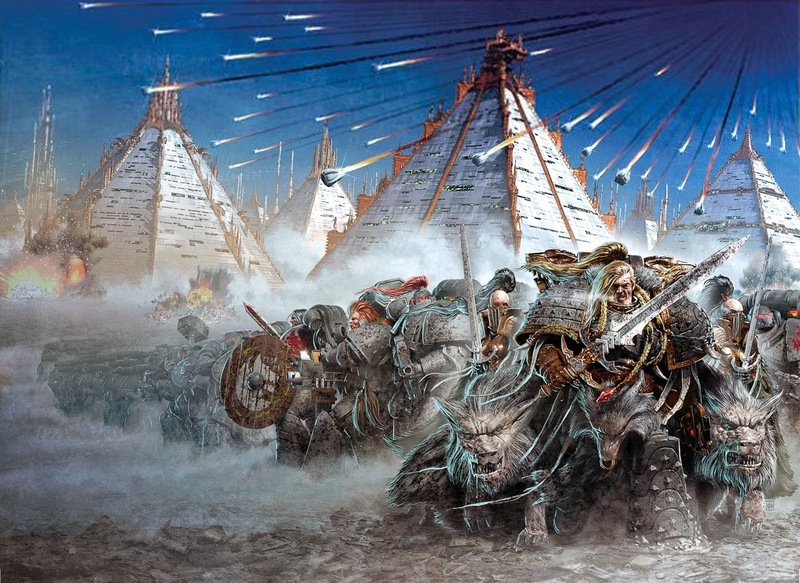 have you got any other info or images on your army, would live to see more exaples of this colour scheme. 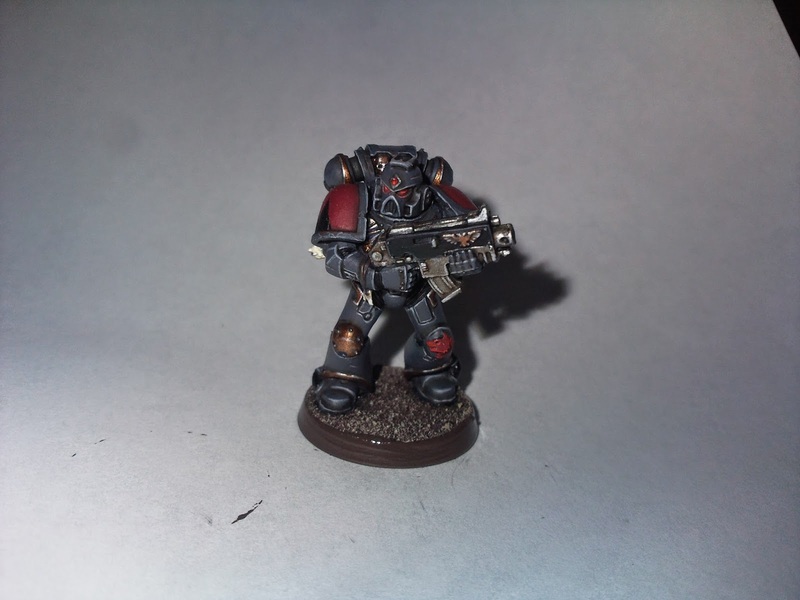 I do have some more pictures of the army, I'll leave a link to my Fb account which has all the pictures of the army as it was before I sold it on. 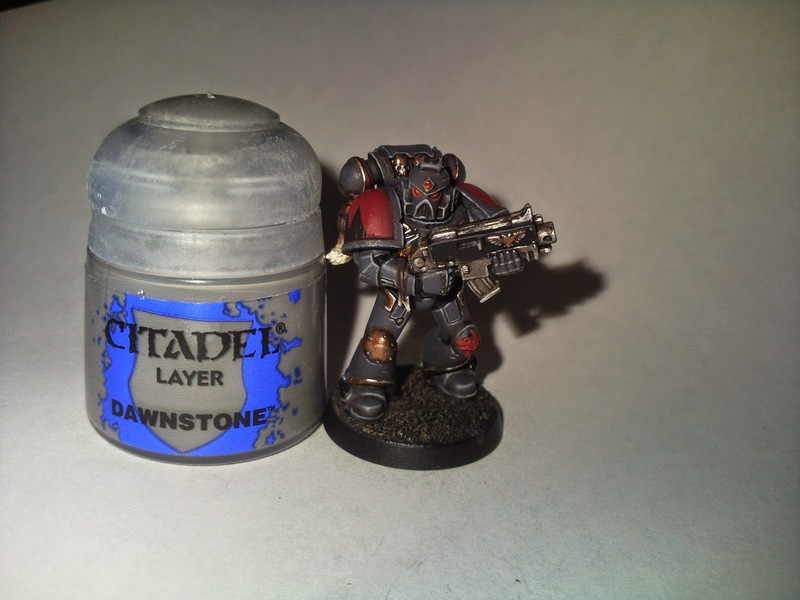 Thanks for the comment, glad you like the tutorial and the colour scheme. Thanks, that's a lot of incredibly well painted miniatures, i've got a set right here that i'm gonna be painting like this. you clearly love your hobby. Also, your Mrs looks well fit. (not relevant to the topic, but if you're gonna share an album with pics of her in it, expect commentary, this is the internet after all). And you met Dan Abnet! Ha ha, glad you liked them. Meeting Dan Abnett was great! Top bloke he is.